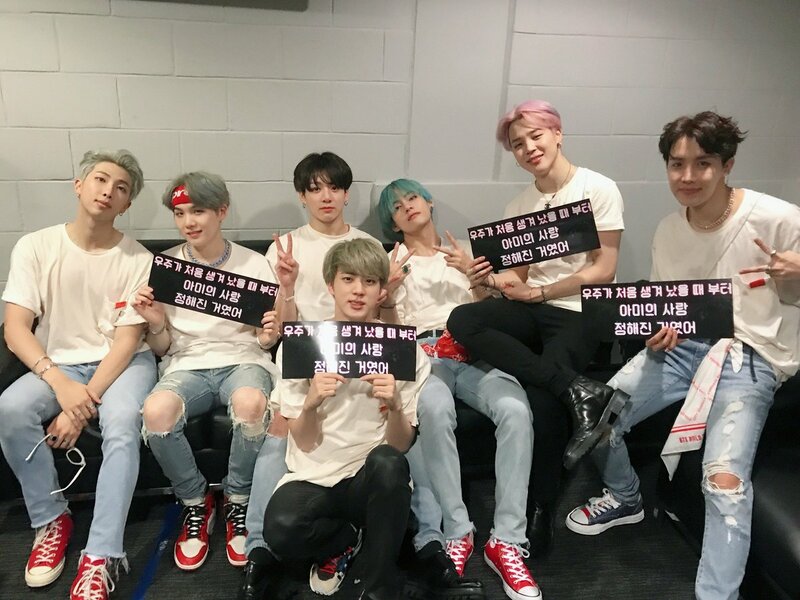 There’s something jarring about this picture. 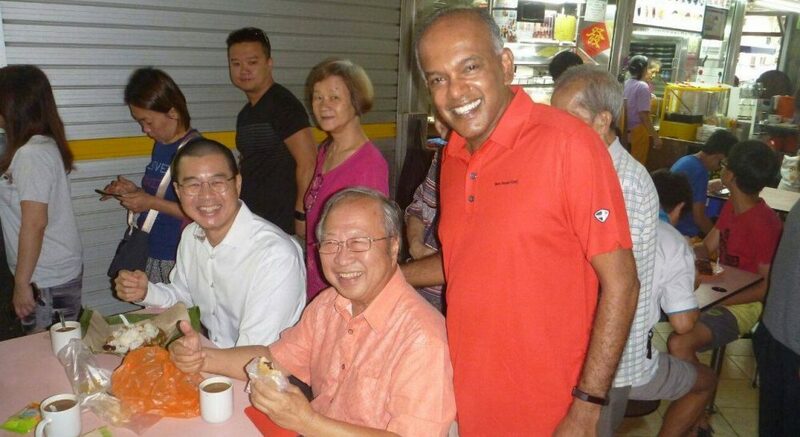 Minister for Law K. Shanmugam ran into the recent founder of the Progress Singapore Party, Dr Tan Cheng Bock, at the former’s frequent haunt, Chong Pang hawker centre, and they decided to take a photograph. Shanmugam’s conspicuous red-eye, the disturbingly bright flash, the background auntie’s slightly bemused expression—they speak to a truth beyond what the camera captures. 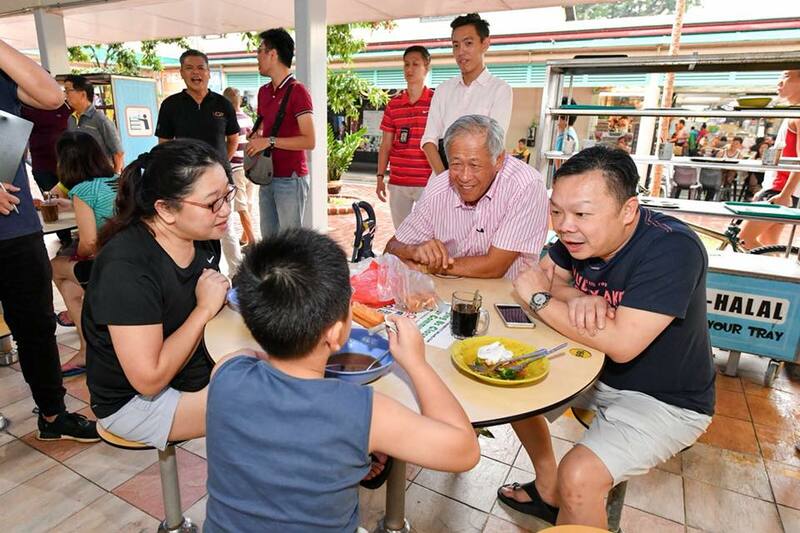 In Singapore, the occasional (but always awkward) hawker-centre-photo-op is something we’ve come to expect from local politicians. No matter the flavour, every Singaporean politician knows that the hawker centre walk-around (and obligatory subsequent Facebook mobile upload) is a staple of the political landscape. In a country so famed for its food, chatting with Singaporeans about bread-and-butter issues over their morning bread and butter does seem like an excellent way to connect with their constituents. 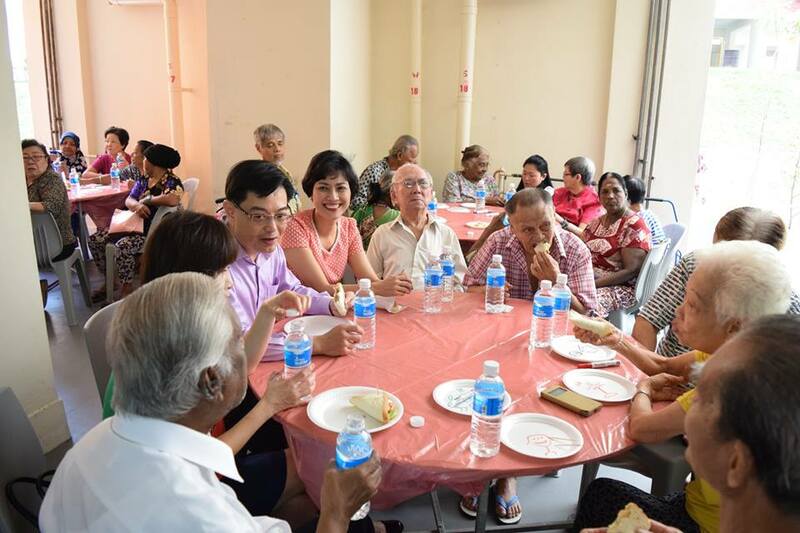 From the ‘candid’ shots of Minister for Defence Ng Eng Hen, grinning eagerly at a young boy as his father looks on with “Don’t-say-something-stupid-ah-boy” plastered on his face, to the grainy photos of Crown Prince Heng Swee Keat, dining with elderly constituents as one gentleman prepares to eviscerate his sandwich; politicians will often chow down to get that coveted #relatable factor tagged to their public image. However, politicians are in reality an elite social and financial class. While everyone agrees that kopi-O and kaya toast make the best breakfast, there is something extremely patronising about the powerful wielding photos of hawker centres for the express purpose of appearing relatable and down-to-earth. Oh, my! Grandpa, what big teeth you have! Sometimes, these opportunities backfire. 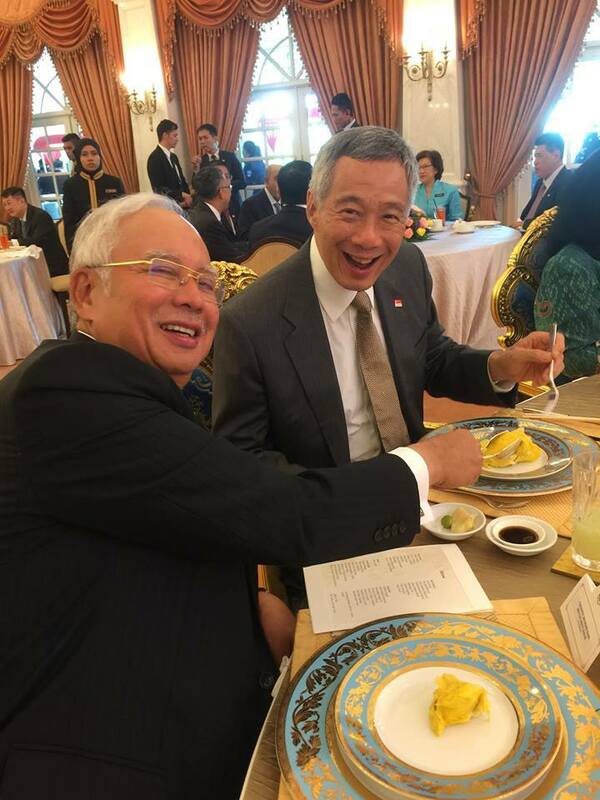 During lunch with the former Malaysian Prime Minister, PM Lee was captured munching on some durian with that most unholy implement, the metal fork. However logical it may seem for a head of state to eat with utensils (he will have to shake hands with many foreign dignitaries at such an event), one’s first emotional response to this photograph is invariably to brand it a sin against mankind, to be purged with fire and fury. Watch out, PM Lee! Najib is embezzling your durian! Even foreign politicians have decided to take advantage of Singaporeans’ food fascination. 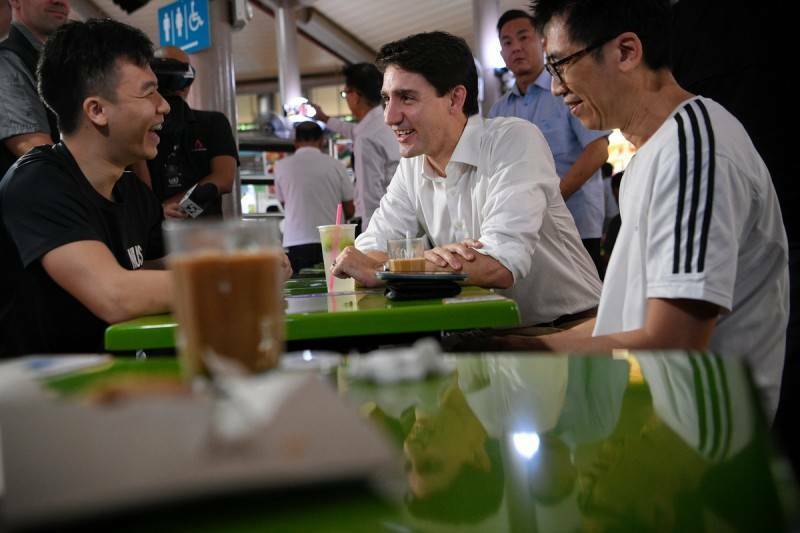 When Canadian Prime Minister Justin Trudeau made his local debut for last year’s ASEAN Summit, he decided to take 5 for a pit stop at the iconic Adam Road Food Centre, while sipping some lime juice of all things. As we see him chat up the locals, one can’t help but feel a dead weight slide into their gut, and not just because of the four prata kosong I walloped for lunch. Trudeau’s smiling face, the snazzy camera angles, the ready-made Straits Times headline; a lurching sensation grips us, as though we’ve fallen headfirst into Uncanny Valley. In other countries, however, politicians sometimes lose the war on food. 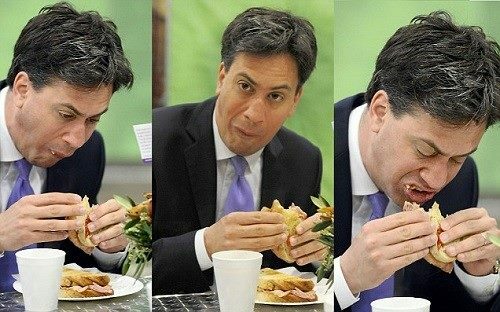 It would be hard to forget how UK’s former Labour leader Ed Miliband lost the 2015 general election to a bacon sandwich; an unflattering photograph from the previous year was plastered across The Sun on the day before the election, asking voters if this was the man they wanted to lead the country. If not for that blasted bacon bite, one can only imagine the world we would be living in today. Miliband’s rival, David Cameron, won the election; Cameron held a referendum on staying in the EU, and voters spanked him out of office by deciding to Leave. The sandwich has since been bandied about as the bacon that began Brexit. The incident has been described as a right-wing media smear campaign; in fact, many Brits took to social media to chew sandwiches as disgustingly as the Labour leader in a show of solidarity. He messed up, we all mess up, that’s human. 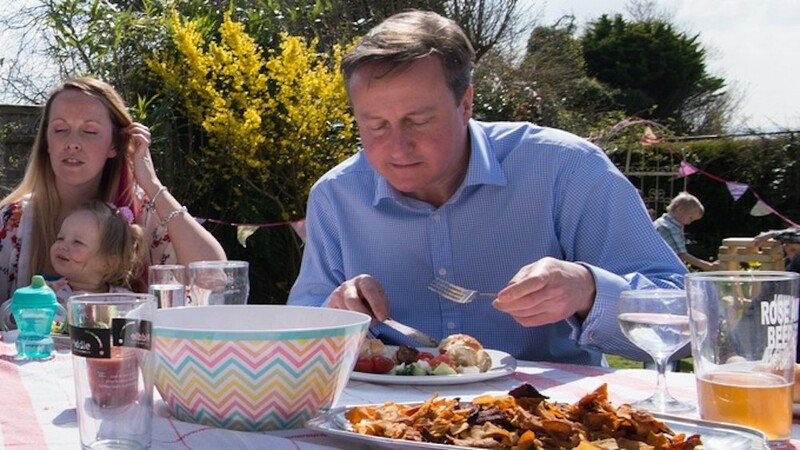 What’s not human, however, is dissecting a hot dog with a knife and fork, the way the Cameron-3000 decided to, in an ill-fated attempt to avoid Miliband’s blunder. At least Miliband’s gaffe was relatable; David Cameron fell squarely into uncanny valley, failing his programming parameters. 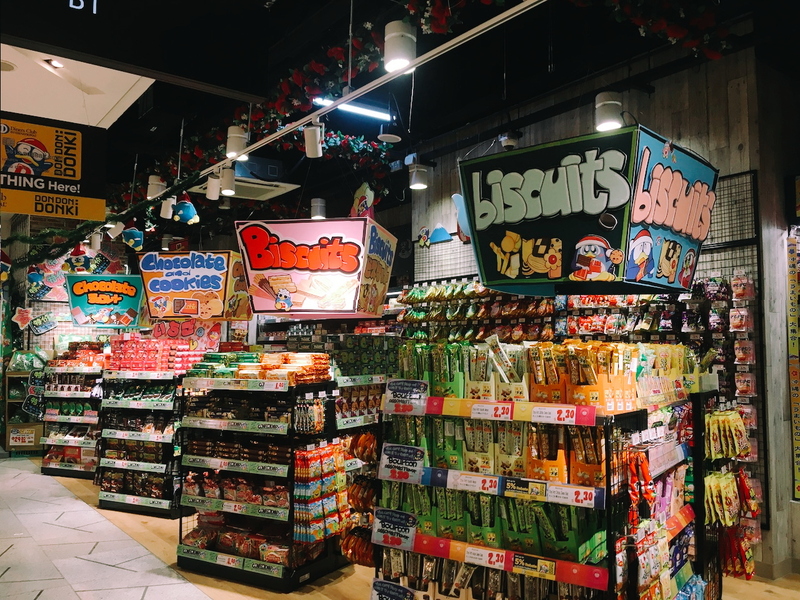 For all countries, food is a source of pride, and a hallmark of national identity; it is simultaneously deeply personal to families and individuals. We love our local wildlife, but most Singaporeans don’t keep an otter at home (I hope). We cheer for Joseph Schoolboy-looking, but I won’t go near a pool if I can help it. 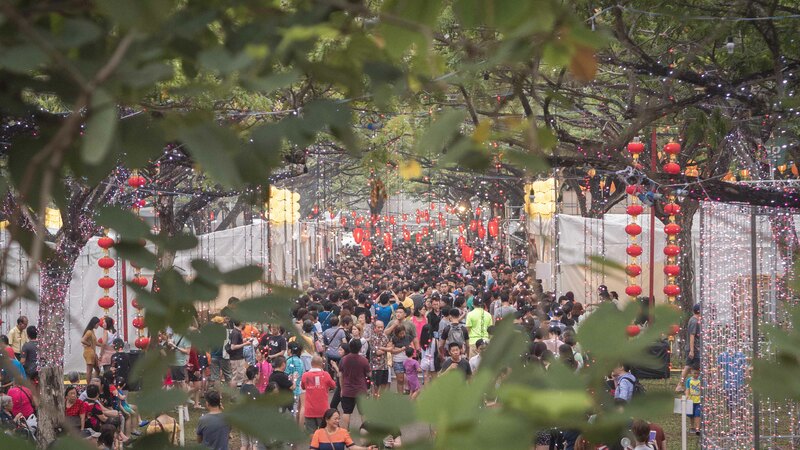 We celebrate Michelin-recognised hawker stalls, and we enjoy the same hawker food every day of the week. Food is something deeply private, familiar, intimate; we connect emotionally to food like no other inanimate object. It fills us, warms us, nourishes us. It’s only natural that we feel a little strange seeing politicians eating the same food we put in our bodies. This conflation of the deeply familiar with the recognisably unfamiliar doesn’t sit well, and we’re left staggering around uncanny valley. 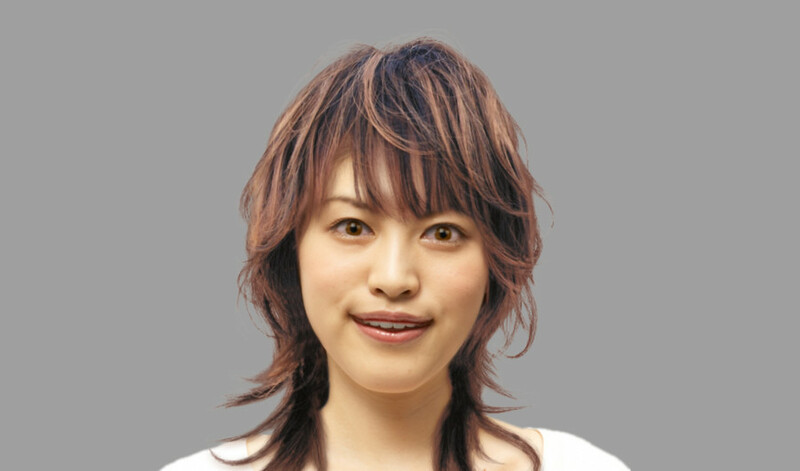 Hi, I’m a politician, and I’m human just like you! The staged photo ops that many politicians engage in only accentuate this strangeness. This is the core concept of the uncanny valley; when something gets so close to the familiar but falls just short, it is often far weirder than something that is plain unfamiliar. Politicians taking staged photos, on stages, seems normal. Similar photos in hawker centres, doing everyday activities less than realistically, seem to fall just short of familiarity. Common Singaporeans rely on hawker food for cheap and easy meals, especially those who cannot afford otherwise. And sure, politicians are not excluded from enjoying hawker fare. But to then use that food to say, “Look! I’m just like you,” when our circumstances differ greatly, can come across as insulting to the intelligence of average Singaporeans. However, there is hope for the political class. While scrolling through the instagram profile of Minister Shanmugam, who provided the inciting photograph for this tirade of an article, I chanced upon another photo: familiar, friendly, even fraternal. 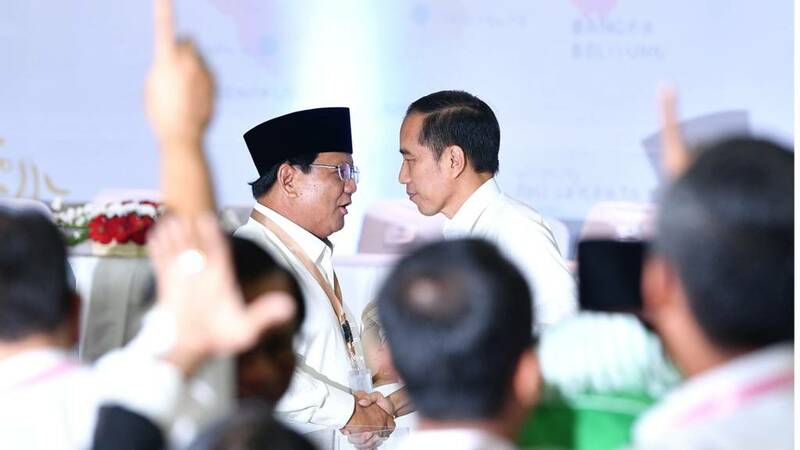 To public relations professionals, the key features of political photo-taking are undoubtedly staging and exactitude. However, when it comes to food, I think what people appreciate is the personal and private. Perhaps the reason this image doesn’t incite ire from my soul is not the half-finished food, the unconventional framing, or the unknown location. 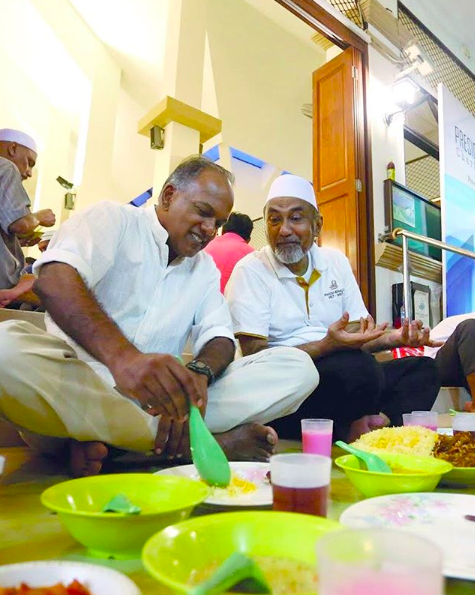 Instead, it’s that Shanmugam is seemingly struggling to hold on to the conversation in the face of the delicious rice calling to his stomach, as indicated by his loving gaze. Food, unlike politics, is deeply human. And when politicians eat, it can be transformed into something strange, something uncanny, or even something shameful (RIP Miliband). Photo ops don’t bother us because they’re politicians. They bother us because they’re impersonal, and we see right through their efforts at pandering. We share a common food, not a common rice bowl; using food photos as a tool to insinuate otherwise is disingenuous. Maybe the real reason we hate political food photo shoots is because we secretly fear the same fate will befall us. That we’ll take a seat at our favourite hawker centre, ready to plunder a bowl of wanton mee, only to be interrupted by our local MP, delaying the satisfaction of enjoying that object of our most primal desire: food.